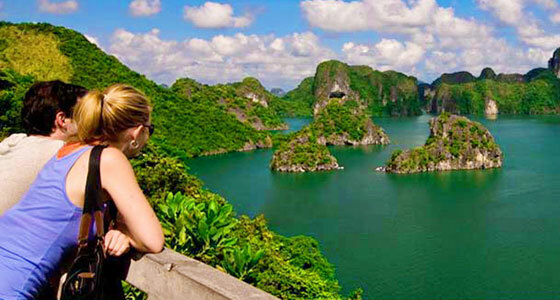 For those wishing to experience the most untouched reaches of the Ha Long UNESCO World Heritage Site while remaining in complete luxury, the Garden Bay Cruise for 2 or 3 nights is the perfect choice. The 2 day tour will allow you plenty of time to take in the gorgeous bay, while the 3 day tour also adds some time on Cong Do and in Cap La Bay. Bear in mind that the cabins on-board come in three different classes for both tours, these being Premium, Luxury and Legend. The only difference between these is the level of luxury in your on-board cabin while the itinerary stays the same. You will be picked up at your hotel in Hanoi at around 7:30 for your drive to Hon Gai Harbor, arriving at 12:30 and spending 5-10 minutes to board the cruise by tender. You will then receive a welcome drink and a short briefing before having lunch from a set menu as we cruise towards Vung Vieng Fishing Village. Once there, guests can choose whether they want to discover daily life in the village by bamboo boat, or explore freely by kayak for an hour. We then proceed to Ban Chan Beach where you can spend some time swimming and sunbathing before returning to the boat for happy hour at 17:30. At 18:00 there will be a cooking class you can take part in to learn the art of Vietnamese spring rolls before BBQ dinner is served at 19:30 and you have the rest of the evening to participate in the various activities on-board such as squid fishing and karaoke. You will spend the night in your cabin on-board. Early risers can take part in a Tai Chi lesson as the sun rises, followed by a buffet breakfast at 7am. We then visit Thien Canh Son Cave, the only cave in Bai Tu Long, before returning to the boat at 9:30 for checkout and relaxation on the top-deck accompanied by a fruit carving demonstration. 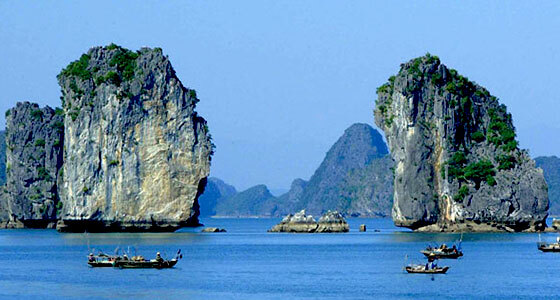 At 10:30 lunch will be served as we cruise back across Halong Bay, reaching the harbour at noon where our driver will be waiting to drive you back to Hanoi, where you’ll arrive at around 17:00. Early risers can take part in a Tai Chi lesson as the sun rises, followed by a buffet breakfast at 7am. We then transfer by smaller boats to the Cap La Area, where we’ll spend some time fishing with the local fishermen before returning to the cruise at around 11:30. Lunch will be served, consisting of seafood and BBQ, at noon as we cruise towards the Vung Ha area for 3 hours spent kayaking and swimming. Finally we return to the boat at 16:00 with the evening free, other than dinner which will be served at 19:30. You will then spend your second night on-board. - VND 575,000 is a surcharge if an extra bed is required for FOC child in 2 days/1 night. FOC 1 child under 5 years old per booking for half day and fund full day SIC day cruise including meal onboard. 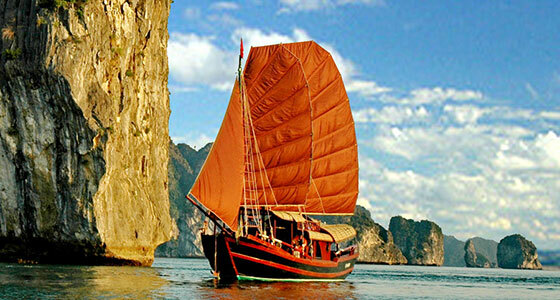 + Discount 50% for half day cruise, full day cruise and meal onboard for child 5 – 12 years old.